Toshihide Migita (1863-1925) Ichikawa Danjuro IX as Benkei, from the series Portraits of Sansho, 1893. Oban. Ichikawa Danjuro IX (Sansho) dominated the kabuki scene at the end of the nineteenth century. 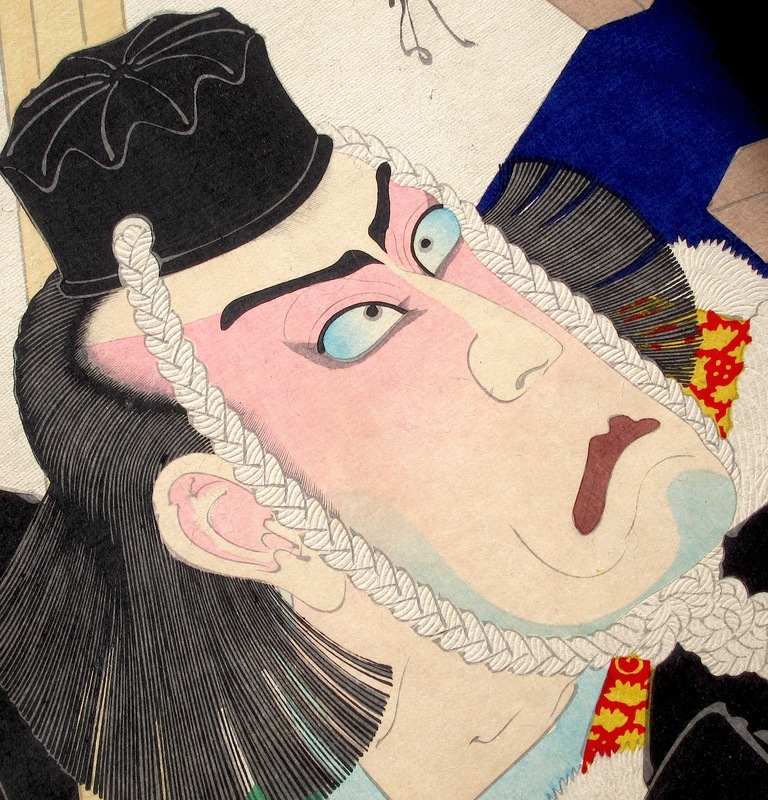 The bulk of kabuki portraits of any quality tend to be of Danjuro in his notable roles - a deliberate policy of the the actor and the theatres to keep the now flagging kabuki scene alive. The most famous of these homages is the great series 100 Roles of Ichikawa Danjuro by Kunichika from the late 1890’s. These portraits by Toshihide from 1893 and the preceding print by Tadakiyo from 1896 predict that series in style and composition. These are terrific prints, some of the best works of Meiji Japan, and although this series and the others in this show by Ginko and Kiyotada are rare, they deserve much greater recognition. Drawn in a traditional style, these dramatic prints owe more to Kunisada, Yoshitoshi (who was his teacher) and to Kunichika than the western influence that he was to work under for most of his career. There is an observable similarity between this piece and Yoshitoshi’s theatre portraits of the 1860’s and 1880’s. 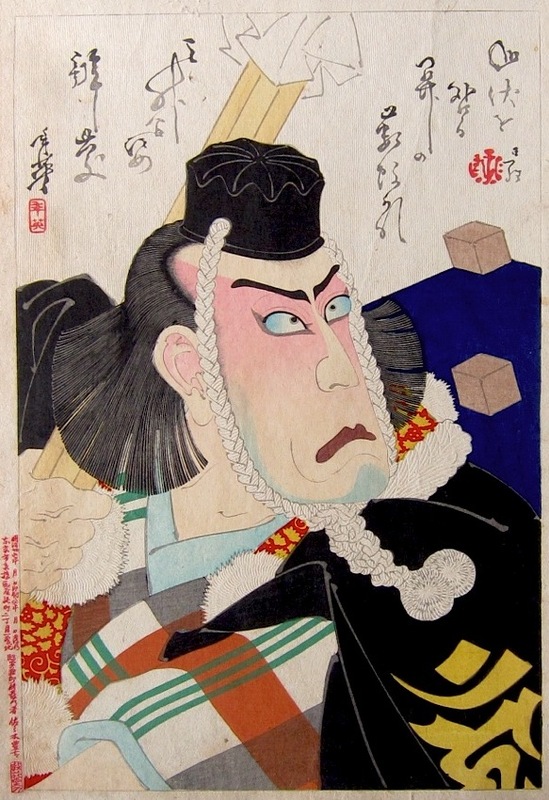 Toshihide shows the actor as the Japanese hero Benkei, wearing his monk’s cap and carrying a stave of wood. Benkei was born in 1155 and reputedly of enormous strength and vitality; he was raised by monks who were both religious and military. As a young man he positioned himself at one end of Gojo Bridge and disarmed travellers of their swords. On reaching his 999th sword he fought with a young nobleman, Minamoto no Yoshitsune, who won the battle of the bridge and thereafter Benkei served as his principal retainer. They fought in the Gempei Wars between the Taira clan and their own Minamoto clan. This is a fine print, excellent impression and colour and in good condition with some surface wear to the lower left.